A 61-year-old woman was seen in the oncology clinic for evaluation of two cardiac masses found on annual surveillance with 18F-fluorodeoxyglucose–positron-emission tomography (FDG-PET) (Panel A). She was asymptomatic. Ten years earlier, biopsy of the nail bed of her left great toe revealed melanoma, which was surgically excised. She had local recurrence 7 years later, at which time she underwent amputation of the toe and received adjuvant treatment with ipilimumab. The current FDG-PET surveillance revealed FDG-avid masses within the left ventricle (Panel A, yellow arrow) and near the interventricular septum (Panel A, white arrow). No other FDG-avid sites were observed. Transthoracic echocardiography and computed tomography confirmed the presence of these two intramural lesions. An endovascular cardiac-biopsy specimen revealed melanoma metastatic to cardiac muscle, with tumor cells that were positive for a panel of melanocytic markers, including SOX10 (Panel B). Metastases to the heart from melanoma are rare, and cardiac involvement with no other sites of metastatic disease is rarer still. The patient started treatment with pembrolizumab, and follow-up imaging showed complete resolution of the cardiac metastases, with no new sites of disease. At follow-up 15 months after diagnosis, the patient continued to take pembrolizumab, with no recurrence of metastatic disease. A 46-year-old man presented to the emergency department with worsening chronic left knee pain. Fourteen years before presentation, he had sustained a gunshot wound to the left knee. Radiographs obtained at the time of that injury showed a metallic bullet embedded in the posterior weight-bearing surface of the lateral femoral condyle and metallic debris within the joint (Panel A). No surgery was performed to remove the bullet at that time. At the current presentation, the physical examination was notable for a large effusion in the left knee. 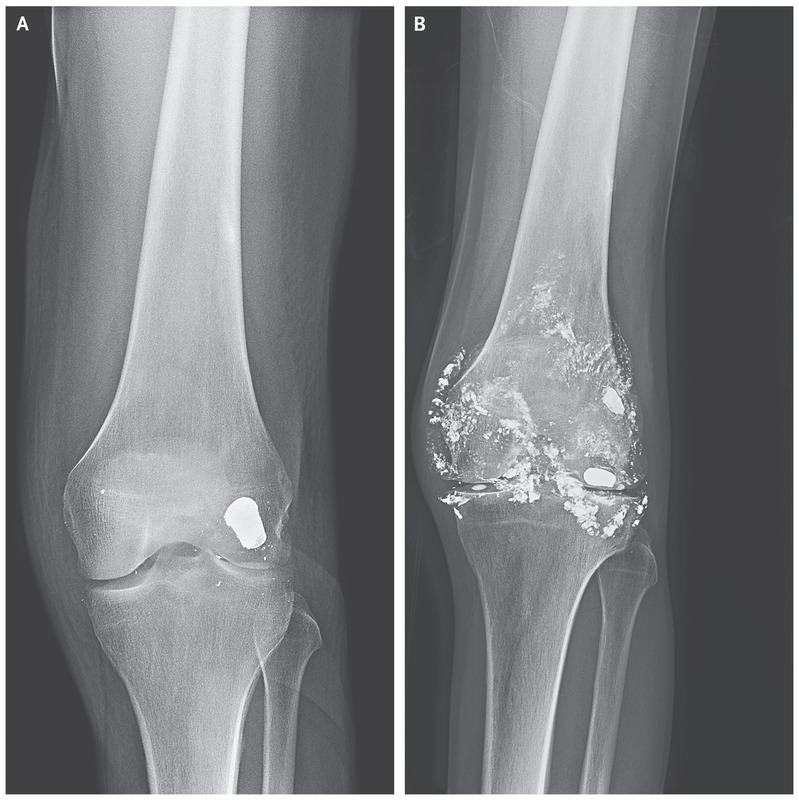 Repeat radiographs showed that, in addition to changes consistent with arthritis in the joint, the bullet had fragmented into metallic particles throughout the joint and synovium (Panel B). Laboratory studies revealed microcytic anemia, with a hemoglobin level of 9.1 g per deciliter (normal range, 12.9 to 16.8), and an elevated blood lead level (182 μg per deciliter [8.8 μmol per liter]). The Mini–Mental State Examination score was 24 (scores range from 0 to 30, with lower scores indicating poorer cognitive performance). The patient showed no other symptoms of chronic lead poisoning. Intraarticular bullets should be removed surgically at the time of the injury. In addition to causing joint damage, intraarticular bullets can fragment and dissolve in synovial fluid, leading to lead absorption and delayed symptomatic lead poisoning. The patient received chelation therapy. Surgical management with a left knee synovectomy was planned, but the patient left the hospital before surgery and was lost to follow-up. An 18-year-old man presented to the emergency department with chest pain. He had a history of Kawasaki’s disease, which had been diagnosed when he was 11 years of age. Despite treatment with intravenous immune globulin, coronary-artery aneurysms were detected on imaging (Panel A shows a coronary angiogram obtained 3 years before the current presentation). At the time of the current presentation, his medications included aspirin and warfarin. An electrocardiogram showed ST-segment elevations in leads V1 to V3. Emergency coronary angiography revealed occlusion of the left anterior descending artery (Panel B). Kawasaki’s disease is an acute, idiopathic, self-limiting vasculitis that primarily affects children. Clinical features include fever, nonexudative conjunctivitis in both eyes, mucositis, cervical lymphadenopathy, polymorphous rash, and changes in the hands and feet. Because not all these features are necessarily present and there is no specific diagnostic test for Kawasaki’s disease, the diagnosis may be missed in childhood or occur at such an early age that the adult patient has no recollection of illness. Affected children are at risk for cardiovascular complications. The patient underwent coronary-artery bypass surgery. At follow-up 3 years after presentation, he was doing well and had no further cardiac symptoms. It gives “coughing up a lung” a whole new meaning. Translate to layman’s terms, and suddenly life is a gory horror movie: some poor patient hacked up a bloody perfect replica of the right side of their lungs. In an Instagram post, The New England Journal of Medicine released a photo featuring the 6-inch-wide blood clot in the shape of a patient’s right bronchial tree on November 23. The medical journal, which has a reputation for publicizing photos of unique medical cases, also shared the image in a now-viral tweet on December 3. The creator of the cast, a 36-year-old man admitted to the ICU for heart failure, died a week after the photo was taken, due to medical complications. Some say this cast of the right bronchial tree looks like red decorative coral, or a holiday tree decorated with red lights. Your pick. The NEJM regularly drops medical images not safe for the squeamish, but this blood clot took the Internet’s breath away. In addition to amassing many a shocked gif, the photo collected 2,244 retweets and over 4,200 likes as of this article’s publication. Unfortunately — here’s your gross content warning — this is not anywhere near the first time patients have coughed up (casts of) their lungs. Twitter user @chifle12 reported a similar gross artifact expelled from a 6-year-old, made of lymphatic fluid. Patients suffering from asthma can also form casts from mucus that hardens in airways. And there’s more. Suffering from laryngeal diphtheria, a 34-year old woman produced a similar cast of her trachea in 1926. More recently, a 25-year-old pregnant woman hacked up yet another bronchi-shaped blood clot in 2005. In that case, the patient recovered and delivered a healthy baby. What makes this most recent instance special is its material and its unprecedented size. Not only is blood typically less hardy than other bodily materials that can achieve this gross shape, but the patient’s 6-inch-wide sample emerged perfectly intact. When unfurled, Georg Wieselthaler, M.D., a transplant and pulmonary surgeon at the University of Florida at San Francisco, identified the origin of the massive clot immediately. How Did This Gross Blood Form? Doctors have a couple ideas to explain this massive medical anomaly. When the human body is running properly, bronchi are pathways for the oxygen you breathe in and the carbon dioxide you expel. Like an upside down tree, the web of branches spindles out into smaller bronchioles that are closed at the tips by alveoli, where your bloodstream carries red blood cells to pick up and drop off oxygen and carbon dioxide. In the case of the unfortunate patient, there was much more than air in his bronchi. When he was admitted to the ICU, doctors hooked him to a ventricular assist device, called an Impella, that helps maintain blood flow. But the turbulence of the world’s smallest heart pumps can cause clots, so the doctors countered the effect by giving the man an anticoagulant to thin his blood. The anticoagulant comes with a price — with thinner blood, the body has trouble patching up any breaks or fissures that open internally. In this case, the patient’s blood made its way to his right bronchial tree, leaving him coughing small clots for days. To form the record-setting clot, doctors guess that an infection may have caused the patient to produce a higher concentration of a fibrinogen, a protein found in blood plasma that acts as “glue.” Gavitt Woodard, M.D., a clinical fellow at UCSF, figures this protein provided newfound hardiness that kept the clot intact. “Because it was so large, he was able to generate enough force from an entire right side of his thorax to push this up and out,” Woodard told The Atlantic. Although the patient ultimately didn’t recover, in that moment, doctors report that he found some relief. In the meantime, the incident leaves the Internet reflecting how the phrase “cough up a lung,” may be uncomfortably close to real life. A 23 mo M presents to urgent care with his mother for evaluation of left foot pain. The child’s father was swinging the child the previous night and the child struck his left foot against a piece of furniture. He was unwilling to move his foot or walk last night but is partially able to bear weight on it now. His mother noted some localized swelling and gave him ibuprofen; she was concerned about a left foot sprain. The patient has no other symptoms or concerns. Physical exam reveals the child disfavoring the left foot. No tenderness is noted on the 5th metatarsal head or medial aspect of the foot. A toddler’s fracture, sometimes known as a CAST (childhood accidental spiral tibial) fracture, typically occurs in a young, ambulatory child (9 mo to 3 yo) who suffers low-energy trauma with rotation. The fibula is unaffected, but the tibia sustains a nondisplaced spiral/oblique fracture, usually in the distal half. Bruising, pain, and a limping gait or refusal to bear weight are common symptoms. This is a potentially occult fracture that is missed in nearly one-third of patients. As such, it may be necessary to obtain repeat films 1 week after initial presentation. Long-leg casting with repeat imaging 2 weeks later is the typical treatment protocol. Healing usually takes 3-4 weeks. Long bone fractures in non-ambulatory children, multiple fractures at different stages of healing, delays in seeking care, or inconsistent/implausible caregiver history may suggest nonaccidental trauma (NAT) instead. In our patient, a tibial fracture was noted on left foot radiographs; tib-fib films confirmed a nondisplaced spiral fracture. No stigmata of abuse were present. The patient was placed in a splint and referred to a pediatric orthopedist for casting. Repeat radiographs 1 month later showed the fracture was healing well, and the child was permitted to return to full activity without restriction 6 weeks after his injury.